I give Gretel a stuffed Kong when I leave the house to help with her separation anxiety. In an attempt to reduce her calorie intake, I switched from peanut butter stuffing to making my own low-calorie stuffing. Each small stuffed Kong holds 2 Tbs so each Kong was almost 200 calories when filled with peanut butter. My goal has been to get it down to 50 calories per Kong. I knew my first attempt failed when my dog would not eat it. I have been trying several different recipes since then. I was trying to make the stuffing with all kinds of beneficial supplements but I know they didn’t all taste that good. I decided to go back to basics and slowly add stuff in. I finally found one recipe that is worth sharing. Directions: Blend all ingredients in a food processor until they form a paste. 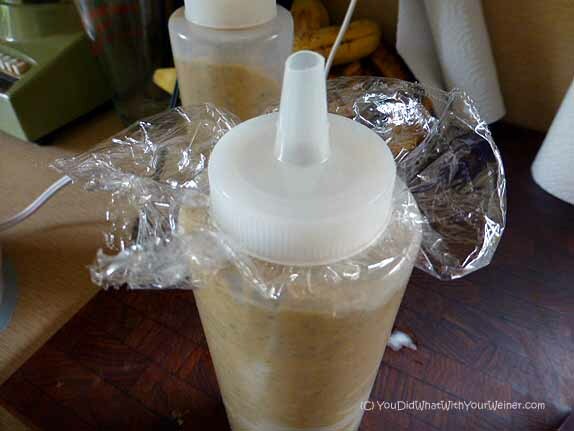 Transfer the mix into a condiment dispenser bottle for easy filling of the Kong and put it in the fridge (freeze what you are not going to use in two days*). Fill a Kong and freeze overnight before giving to your dog. Makes approximately 3 1/2 cups. 2 Tbs serving = 54 calories. The pumpkin flakes and kelp in this recipe are primarily used so the mixture is not so runny. However, Pumpkin is known aid in digestion and kelp contains a lot of vitamins and minerals. The star of this recipe is the Honest Kitchen Pro Bloom Instant Goat’s Milk (affiliate link). It’s a shelf-stable* instant goat’s milk that will keep until you are ready to mix it with water and use it. It also acts as a binder in this recipe but contains important digestive enzymes and probiotics that support a healthy digestive system. Raw goat’s milk such is also known to have cancer fighting properties and it is believed to help many other illnesses. *Once the goat’s milk is mixed with liquid, it must be used within two days. Freezing of the goat’s milk does not kill the good bacteria (I know because the dog Mom from MyBrownNewfies asked) so you can freeze the part of this mix that will not be used within 2 days. Part of the problem with my first batch of Kong stuffing that did not go over well was that Gretel really likes peanut butter and it didn’t contain any. Here I added enough back in to give her the taste but keep the calories to a minimum. She likes this mixture much better. I am going to keep experimenting though and plan to share other successful recipes. That looks like a tasty recipe for dogs. I am lucky enough that my dogs love plain frozen pumpkin puree enough that it is like a treat for them to get an ice cube of that. Which means I can mix pumpkin with a few fillers like frozen blueberries and just fill their Kongs with that mixture. What was the cost for the batch? I am not sure really. I was more concerned with the calorie content and health benefits than cost. Plus, I already had the ingredents sitting around the house. 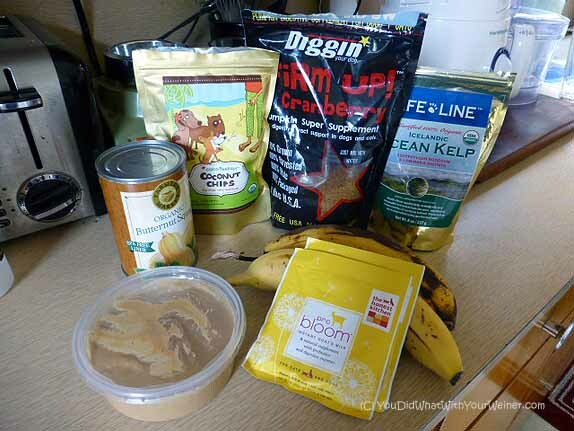 Let’s see….bananas around 1.00, can of organic squash 2.50 (from the hoitey-toitey health food store), peanut butter 1.00 or less, Pro Bloom 1.25. The rest was a small portions of larger packages. My estimates are kelp 1.25, pumpkin flakes 1.00 and coconut flakes (for dogs, the human version is the same and would be cheaper) 1.00. This is a real quick ballpark but maybe $9. Since we use 2 Tbs at a time and it yields 3.5 cups, the cost per serving would be $0.35 cents per serving. Hope that helps. Thanks! I really appreciate the reply! I’m going to have to try this! We are also working on getting our 3 to lose some pounds 🙂 only about 1lb each but like you said it makes a big difference when they are so little! Love your blog and FB page! As I said in the note, changing this one thing about Gretel’s diet has made a big difference in her weight. She doesn’t have a whole lot to lose but I imagine a dog that does could easily lose 1 lb in a year just by switching from peanut butter to something lower calorie like this. I did not taste the stuffing this time but have in the past when using the goat’s milk. I really didn’t notice the goat’s milk but that may have been because the taste was overpowerd by the Kelp (and the fish oil and glucosamine liquid I used the last time). Wow. What a fantastic little recipe. I always just give Ru peanut butter before I leave but you’re right, it gets caloric. I’ll give this one a shot! Awesome recipe! I will have to find a few of those ingredients but as soon as you added the goat’s milk, I knew I could get Bella to eat it. (She LOVES that stuff!) Thanks. She loves her treats but she’s getting a little plump so this is a very nice option. With only two packets and the addition of the Kelp, the taste of the Goat’s Milk was not detectable. I bet it would be if you added a third or fourth packet and left out the kelp though. If you stopped feeding your dogs carbs they would lose weight and not be hungry for more. The ingredients you are using are not appropriate for a carnivore and thus cause weight problems. Thank you for you opinion. We have been over this several times and I do not agree with you (and do not wish to argue this point with you again). As I respect your opinion, I hope you respect mine. It doesn’t matter if you agree with me or not. What I’m posting isn’t opinion, it’s factual. Dogs have no nutritional need for carbs and feeding them cause them to be fat. I don’t have to watch how much my dogs eat and none are overweight because they stop eating when satisfied. When you feed a food that lacks things they need they are never satisfied and eat too much. What you are feeding is not something they would eat if they had a choice. My diet is exactly what they would eat. That difference is fundamental for their health. Healthy dogs can fight off heart worms on their own, hardly ever get stomach worms of any kind, never need a “dental”, hardly ever get diabetes (your kong recipe is diabetes waiting to happen) and the list goes on. Science is behind what I say, not opinion. I am curious about what you mean by “my diet”. Something that you make at home for your dogs? It’s not made at all, it’s fed raw, as is, in as natural a state as can be. Meat, bones and organ meats similar to what canines eat in the wild. If you are “making” dog food it’s not a part of their natural diet. Processing foods are bad for dogs as well as humans. You don’t have to agree with it by any means. However, should you not allow other points of view because they differ from what you know? My definition of “allow” is to let someone leave a comment, leaving it on the blog for others to see and not telling them they are wrong (as you agreed, that does not mean that I cannot disagree and say so respectfully). Do you not agree I have done that? I don’t see how I have not “allowed” you to make the same comments about raw feeding for over 6 months on blog posts not about the raw food/kibble/what to feed your dog debate (ie. a little off topic). Am I missing something? My posts are moderated and at least one has not been allowed to show. It says “Your comment is awaiting moderation.” so evidently others can’t see it. Ah, yes. I see it now and it’s approved. I explained to you before about comment moderation and that it has to do with how you enter your information and is not something I control exactly. I have comment moderation enabled for every new commenter and for some reason the moderation screen thought you were a new commenter. Moderation is completely different than deleting your comments. Moderation just means it is waiting for my approval. I have always approved all of your comments but am not always sitting at my computer so sometimes so sometimes, in extreme cases, it can take up to 24 hours to approve. Typically, it happens within an hour. Yes, cost is less of a factor with small dogs 🙂 I am getting all fancy here but I have heard of people using straight banana, or banana mixed with some peanut butter, instead of peanut butter alone. It seems to me that it would cost about the same as peanut butter to do that without all of the calories. Oh how I love new KONG recipes!!!!!!! I will def try these! That looks pretty tasty for a pup. Congratulations on the weight loss Gretel! This sounds like a pretty good alternative for Kong Stuffing. We are really liking that Pro Bloom as just a food mix in. I never thought about using it for other recipes! Great post! I think these are very healthy, chock full of good things! And, reading through the comments…dogs can not naturally fight off heartworms or any parasite, no matter what you feed them! But a healthy diet (and good treats like these) can prolong their lives and prevent weight problems. I’m going to whip up a batch of Kong treats! Thanks for the great recipe. Are the coconut chips specially for dogs or can you use ordinary coconut flakes / chips? These happened to be especially for dogs but they are basically the same as the human ones…just marketed different and cost more. I am going to use human ones next time. This is brilliant! Mr. Barney Stinson is currently laid up with a back injury — every doxie-mama’s worst nightmare. The little dude doesn’t like to walk or be active (he’s not overweight either — maybe by 1 pound) — which is supremely disappointing b/c I would love to have an adventure weiner — but he does like to climb around the barriers we’ve made for him and fly off the furniture. The good news is that this has given us the opportunity to crate train him (because he was sedated for a couple of days, and got used to it), so now he’s likely to be more interested in doing stuff outdoors with us since he doesn’t get to run around the house willy nilly when we’re gone anymore. He used to have free range, but since I can’t trust him not to be a moron and hurt himself, he is getting crated. Which brings me to my point: this is a brilliant idea. I had been giving him PB (homemade) to take his sedative when we were sedating him. And I give him a “special” (oh boy, he thinks it’s special. so special that he carries it around with him until I feed him and snag it) bone when we leave. But I think if we gave him a kong with some nutritious filling, he’d like it even more. I’m thinking I could add some glucosamine and omega 3 to it. I’ve already got him on grain-free salmon food (good lord this dog is pampered). Anywho, I’m going to have to try this! thanks for sharing. oh man. if there’s peanut butter in it, he’ll eat it. 🙂 thanks for the tips. I never get anything like this – I’m so hard done too! I’m gonna have to show my Mum this! Holy woof you’re a genius! 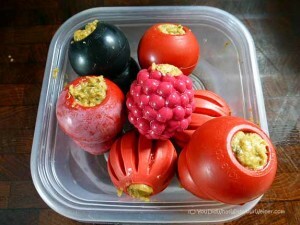 I have never thought of making a couple days of portions and using a pastry bottle to fill Kongs. 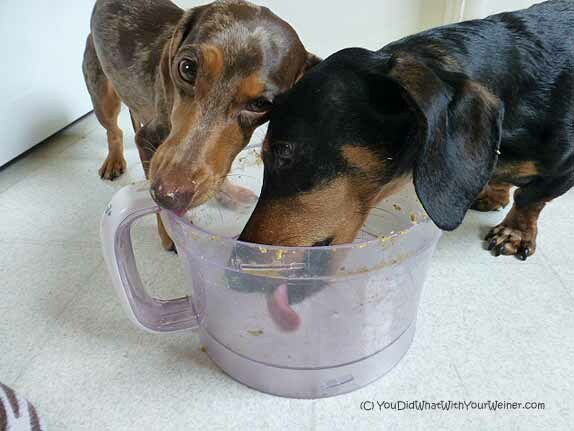 You may have just rocked my world – and the Kong Recipe looks pretty good too! 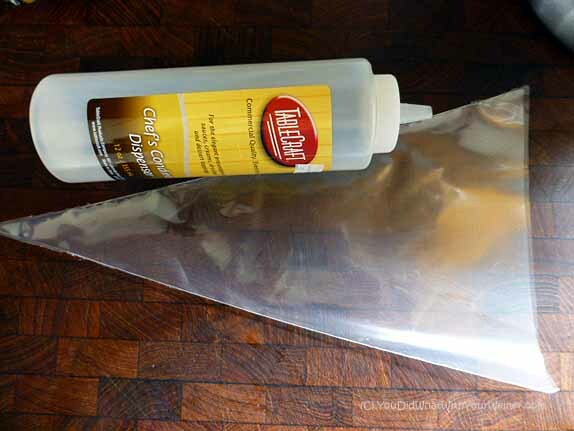 It’s the frosting bag to fill the condiment containers that is genius…..if you ask me. Ha, ha. Good point. You could totally skip a step. Did you know you can get tip caps and bag ties to completely seal pastry bags? I knew about the bag ties but not the tip caps. However, I have tried just using the bag with a tip with a big opening and it didn’t work so well (no structure to the bag so messy). The condiment container is not without its problems either though. If the mixture is too thick it gets stuck in the bottle and has to be washed out…which is wasteful. Hey…I just had another genius idea….if the mixture is too thick and stuck in the container I can add water to thin it out! Damn, I’m on a roll. Ha, ha. Sounds like a little bit of work but worth the effort. We’ve always used low-fat PB in our kongs but now that we’re using kibble and treats as part of a renewed training effort, I was just thinking, “hmmmm…maybe we need to cut back on the kongs…even the low fat variety”. This might be a very good alternative (or some variation of, depending on the pup). Thanks for the idea! Well, I am LAZY so making this stuffing doesn’t take too much effort 🙂 The hardest part is doing the dishes afterward. Fantastic recipe – thanks so much for sharing. I’ll share it on my page too. My readers will love it. Our dogs love peanut butter too and I try to be careful about how much we give them, because it does add a little junk in the trunk. And 1/2 pound is absolutely great. As you may remember, our dogs are on a raw diet, but we give them treats like this for fun – especially on hot days like this weekend. They love it. Thanks for the tip on the dispenser – I can’t believe I never thought of that before; wow that’s going to save me some time. I’m wondering if I can use coconut oil in place of the coconut, but then I might use too much, which isn’t great for the hips. Thanks again; off to the store!